The hardest discovery in my health and wellness journey has been letting go of being a victim and giving in to the pain and working on my self before I could make amends with any piece of my body, or another person. I was unable to focus because I was in a constant cycle of survival. Like a hamster on a hamster wheel, unable to jump off at any time, I felt forced to stay on because getting off meant I had no idea what path to go on or what I was supposed to do. There as no rule or guide book, only my inner wisdom ready to help me along the way. I needed to get out of the cycle because being in that cycle wasn’t healthy. It wasn’t helping me at all. It was a slow death. One that we see every day in this country. We die because we’re sick. We die because we commit suicide. Rarely do we get out of the race and rise from the ashes. By the age of 4, ¼ of children will witness or experience at least one traumatic event or abusive situation (1) and in 2013, approximately 50% of adolescence say that they’ve experienced at least one traumatic event in their life (2). And a staggering 1/3 of those surveyed experienced 2 or more traumatic experiences by their 18th birthday (2). As the number of these traumatic experiences go up so will the risk of health problems. By the time of my 18th birthday, I had an ACEs score of 7 out of 10. (Find out your score here) Without knowing the risks at the time, I entered adulthood with high hopes of leaving my childhood behind, meant I could move on with my life. But it wasn’t that easy. Instead of getting better, my health was detreating at an alarming rate and by the time I was 28 years old, I was on the brink of death, in my own personal hell, waiting and praying for death. I wish I could say that my story is unique, but it’s not. Far more adults are in a similar situation and no one is getting the relief or help they need and deserve. I did seek professional care, not only from medical doctors for my physical health, but therapists for my mental health. And though I felt like I was getting better, it was temporary, something was missing, and I didn’t know what and I didn’t stumble upon it until many years later. On NYE of 2008, I hit rock bottom. I had already made my peace with death, believing that my life would end before my 30th birthday. I was constantly sick and every time I caught another illness, it would take longer to treat. What shook my world was my husband begging me to try something new anything to help me get better. I decided to try more holistic and alternative methods for healing and that began my journey of taking myself from the brink of death to where I am today, a healthy and vibrant woman! I had suffered for so long from many chronic illnesses that I was skeptical that I’d be able to heal myself from anyone them. I just wanted to be able to enjoy life again! To spend time with my kids without feeling winded or too tired and exhausted to be an active person. I hid my illnesses well, not many people knew how sick I really was or how much I was struggling. After a while I learned to be comfortable in the pain because I didn’t know any better. My massive shift from being sick with multiple illnesses to the healthiest I’ve been in years began in 2009 and skyrocketed in 2011 and it continues to improve year after year. It wasn’t easy, I spent years working on my inner self, facing the ugliest pieces of my soul and showing myself grace, compassion and above all-love was the key to my healing. What I’ve learned the most is that it’s not about the best doctors or the best care facility, it’s about the inner work combined with the medical side that propels us to better health. I still see my primary doctor and I still see my oncologist who helps me manage a primary immune deficiency, but those visits are routine in nature and not because I’m sick. I am regularly working on my mind, body, spirit sides of myself daily. It’s not a one and done thing, it’s constant, ever evolving. And what I’ve learned the most is that there is beauty in pain and that in order to heal, you must be willing to walk through the flames of the pain in order to rise from the ashes. 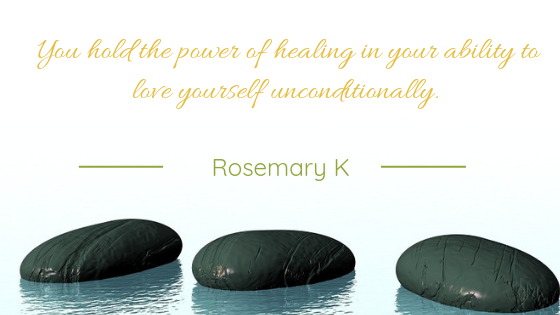 Rosemary K is dedicated to improving the quality of holistic wellness through exceptional healing programs for mothers and women entrepreneurs. She specializes in the holistic arts such as Reiki, crystal healing, meditations, mindfulness, and spirituality to elevate the mind, body, and spirit of her clients.